I honestly wasn’t going to do a Stitch Fix this month because of money, but I forgot to cancel it and then I knew we were having a 60th Birthday party for my father-in-law this upcoming weekend so I hoped I might get something cool out of it. I picked this box up on Tuesday, and I just haven’t had a second to write this post! If y’all have some quick thoughts/opinions for me today on it, that’d be great because I need to return it by tomorrow. I’m pretty underwhelmed with this month’s selection – am I just in a blah mood or am I right? This scarf is super thick and would be really warm this winter. I just don’t have much at all in my wardrobe that would coordinate with it, so…? I first put this sweater on and thought HELL NO. It’s like having bat wings. Very weird. But the longer I had it on, the more it grew on me. I don’t know? Is this the style now apparently? It was super warm and comfy but looks more stylish than a hoodie, so maybe it’d be a good addition to my wardrobe. The pants are the same brand as the patterned ones I got last fix (I actually asked for them in black). I like them, and I think they could work with boots in the winter too, but that crop length is just hard for me to love. How about you? I wanted to love this, but somehow the fabric & draping just seems to accentuate my stomach, so blergh. I look like I’m slouching no matter how I stand in this sweater. I like it from the back, but the front and sides? Meh. So there ya go – thoughts? Would you keep the pants? That first LeLis sweater? The scarf? Nothing? Help! For those who are new to these posts, Stitch Fix is a stylist service for which you pay $20/box. The frequency of box shipments is up to you – (as often as every 2-3 weeks or on demand only), and if you keep any of the 5 items in each fix, your stylist fee goes towards the purchase price of what you keep. You give your stylist feedback on a form on their website and through Pinterest boards, blogging, etc. I like that it pushes me outside of my comfort zone to try new pieces on in the comfort of my own home, and anything I don’t like I can easily drop back in the mail in the included postage paid envelope. Pretty darn cool! My goal is to find one new piece I love with each fix, but if you love all 5 pieces, you get 25% off the entire box.The pieces aren’t as cheap as you’d find on a bargain website, but I do not have the patience to shop on sites / in stores like that. It is worth every penny to have it shipped to my home and I can try the items on while the kids run around being crazy. If you’d like to try it, please sign up through me and I’ll get a $25 referral fee. Thank you! I like the purple top but would like it better at about $10 less 😉 Likewise, the pants are nice but (for me) not $98 nice. Meh to everything else. Keep the dolman sweater! Absolutely love. It looks great on you, and seems different than your normal staples. Black pants are cute and you’ll probably get a lot of wear out of them. But if you’re only buying one thing, get the sweater. The blue sweater is too big on you…that’s why it hangs funny. I think the black pants would look super cute with booties. I also love the bat wing sweater on you! No to the scarf, jersey top and cardigan. The pants are cool but $98 is so expensive! Not sure they are $98 cool since they are crop. If you love the fit and think you would wear them often with boots or sandals, then keep. If you wouldn’t want to grab them often to put them on then don’t. I was initially no on the sweater, but the more I look at it, the more I like it. 🙂 So if you keep only 1 thing, I say sweater! I think that style is definitely in. I really love both dolman tops on you. 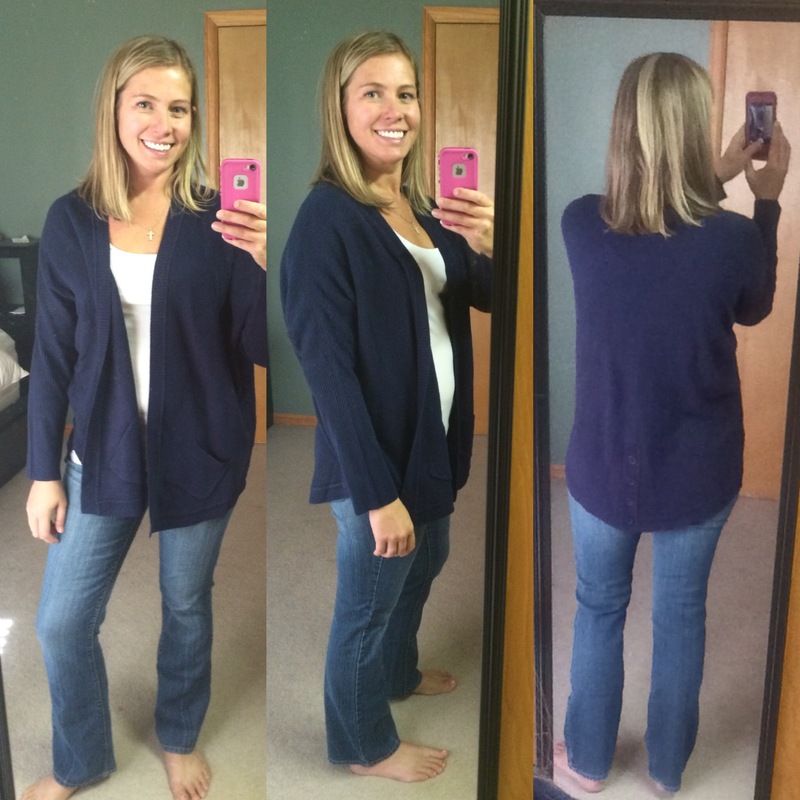 My thought on that cardigan sweater were the same… Great from the back but… No on the cropped pants. It’s winter! I almost bought a sweater called BAT WING SWEATER and still may. I’ve always loved dolman sleeves. I do like that sweater. I hate scarves, so you know my vote. And no on that purple top. Cooking… Had to be brief!!! I think the pants are nice. $98 is a ton of money, but I’ve never even thought to wear cropped pants with boots in the winter (duh) and you could wear them in the summer to work, right? Bat wings made LOL. I don’t like anything else. Also, this could have been an ad for your Beachbody stuff bc damn! You look amazing. I think I’d send it all back. Maybe keep the scarf if you don’t want to lose the fee. I like the scarf I don’t know if you like it. I love the bat wing sweater! Everything else goes back! Who wears crop pants in the winter?? Well, I live in boots in the winter, so that’s the only reason I considered keeping them, plus I’ll keep them forever cuz that’s how I roll, so there would be plenty of summer times to wear them in as well. 😉 I suppose that’s my issue with style too! Both Dolman all the way. I love mine. They look great! I think your stomach looks great! I always read, but never comment, first thought when I saw the sweater before reading your comments was LOVE. Keep it. It will be great for those cold days, when you want to be cuddly warm. I’m from the MN and own a couple like that. they are great. I also like the purple top, but if you think it draws attention to your tummy, you likely won’t wear it. Nothing wows me. I would probably send it all back. I know you’ve probably already sent stuff back, but I love the batwing sweater. I have a few like that and they are perfect for comfort at the office on a chilly day. Sometimes I even layer a very lightweight long sleeve black tee under them for more warmth. The purple shirt may have accentuated your belly, but dayum – your booty looked great! I like the Queensland jersey top – I think it drapes nicely and doesn’t really show your stomach? but maybe that’s just me? I love the scarf on you, i am a bit biased love scaves and you don’t have to match them with outfits. I often wear a different colour pattern just to make the outfit look different. Love the batwing in the picture makes you look super slim. Pants look great on you if they are comfy i would get them. Really dislike the purple it’s a big block of colour and there is something not quite right I think it might be the neckline is just a tiny bit too high. Blue cardi too big. So cool to see what other options of clothes people are looking at. You’re looking at jerseys I’m looking at summer dresses it’s weird. I like the dolman sweater and the scarf. Scarves don’t have to match clothes, they just have to “go” together, any solid top would be great with it. The sweater looks very good and if it is comfy too, it’s a great buy. Doesn’t seem the season for that type of trouser, is it weird under boots (I’m not a boots person)? Love the grey sweater. It would look so cute with leggings and boots! My SF is coming in a a couple weeks can’t wait!